Danlaw, Inc. (Danlaw), a global telematics solutions and embedded engineering services provider, is pleased to announce that its Mx-Suite™ Test Automation Platform now supports the AUTOSAR 4.2.x standard (while continuing to support 3.2, 4.0, 4.1). Mx-Suite™ provides a Software-in-the-Loop (SiL) environment to harness and test AUTOSAR application software. Today’s automotive application software continues to grow both in size and complexity. Mx-Suite™ provides a powerful solution to manage this complexity, by providing capabilities which support MiL (Simulink), SiL(AUTOSAR) and HiL testing phases, making Mx-Suite™ an ideal corporate standard for automated lifecycle development and testing. 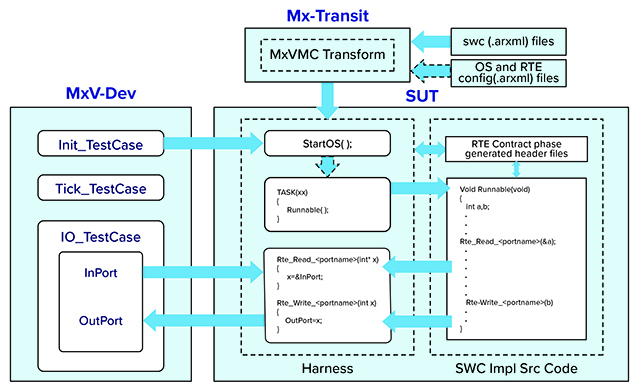 The automated configuration capability of the Mx-Suite™ Runtime Environment (RTE) Emulation and AUTOSAR OS, enables the creation of the SiL test environment for the AUTOSAR software components in seconds. “With Mx-Suite™, in-depth programming knowledge is not required, allowing the test engineer to fully focus on exercising the behavior of the component being tested,” says Michael McCormack – Director of Product Development at Danlaw. Integration testing is made easy through the use of Mx-Suite’s™ automated harnessing of AUTOSAR composition software components. The Mx-Suite™ toolset provides a unique level of automation and capability to test a variety of communication mechanisms between software components including Sender-Receiver, Client Server, Mode Switch and RTE Events.